Autorun Virus Remover provides protection against any autorun virus trying to attack via USB drive. 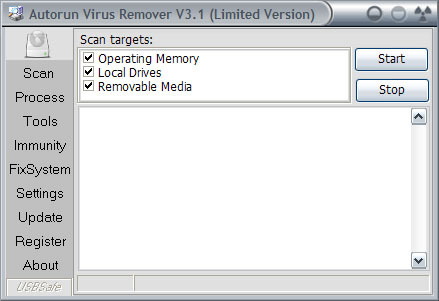 When a USB drive is inserted into your computer, Autorun Virus Remover will automatically scan it, block and delete autorun virus, worms, and Trojan from USB. Also, it can detect and remove USB virus such as autorun.inf virus in computer. Autorun Virus Removal Tool is an antivirus which can provide full protection for you when using USB drives. ...... antivirus always can't get rid of the virus completely, the virus comes back after a few seconds of removing it. * Prevent autorun virus infecting computer from USB drives. - Autorun/autourn.inf virus will automatically spread through your system when you insert an infected USB flash drive into the computer. * Prevent data leak via USB storage devices - You can set the USB port status to Read only or Readable/Writable both with Autorun Virus Remover, also you can disable usage of any USB storage devices to prevent data leaks across USB flash drives. * Autorun Virus Remover is the best solution to protect offline computer - Other antivirus software should update signature database regularly, and they can not effectively protect offline computer which is not connected to the Internet. Removal tool detects and exterminates many worms, trojans and backdoors. After unsuccessful experiment of the military AI control has been lost. Qweas is providing links to Autorun Virus Remover 3.2 as a courtesy, and makes no representations regarding Autorun Virus Remover or any other applications or any information related thereto. Any questions, complaints or claims regarding this application Autorun Virus Remover 3.2 must be directed to the appropriate software vendor. You may click the publisher link of Autorun Virus Remover on the top of this page to get more details about the vendor.